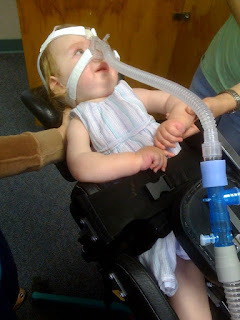 Gwendolyn Strong Foundation : Blog : Gwendolyn Conquering the Stander!!! We are so proud of our little girl. You may remember a post Victoria did back in November 2008 about the debacle we had with the first attempt in the stander. In short, it was a disaster. Well, over the last couple of weeks at our weekly CCS therapy appointments we've been re-introducing Gwendolyn to the stander -- but, this time much, much more gently. First, we showed her the stander and let her touch it. Then we put a doll dog, McGruff The Crime Dog (remember him from back in the day), in the stander and let her watch McGruff rotate up and down. 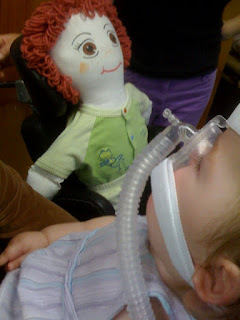 And today we put a doll named Dolly in the stander and let her watch Dolly rotate up and down. We also let her touch the stander again and we could tell that she was ready for a try. 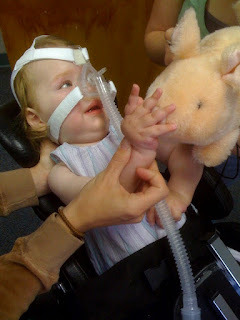 Once she was in the stander she did great -- beaming with pride and playing with "piggy"!!! We're so proud of you Gwendolyn!! !